Eleanor A. Mann, of Atascosa, passed away peacefully at her home, Sunday, February 3, 2019, at the age of 82. She was born on December 4, 1936 in Kalamazoo, Michigan, to Floyd and Jenerva Marquardt, both who precede her, along with her sister, Beverly. She married Alvin Mann on April 11, 1952 in Seguin, Texas. At the age of 57 she proudly obtained her GED. She worked with American Greeting Gift Cards for 20 years prior to retiring from the USAA gift shop in 1989. 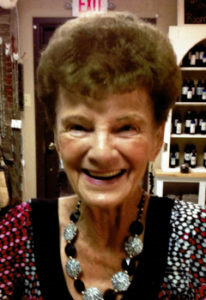 Eleanor was an avid crafter with the Country Gals Market of Devine. Eleanor is survived by her husband of 67 years, Alvin Mann; sons, Alvin Jr. and wife Ginger, Roger and wife Imogene, Kenneth and wife Melissa; daughter, Vicky and husband Roy Billings; grandchildren, Heather and husband Jacob Garner, Scott and wife Julie Mann, Samantha and husband Will Ripps, Mindy and husband Tyler Kierstead, Mackenzie and husband Jordan Sullivan, Riley Mann, Shelley Lamon, Krislyn Mann, Joshua and wife Summer Mann, and great-grandchildren, Izaac Estrada, Nykolas Estrada, Colten Handley, Kason Garner, Bryleigh Garner, Jacob Mann, Adelynn Kierstead, Kayleigh Sullivan, Wyatt Sullivan, Hudson Mann, Whitley Mann, Harper Ripps, and Charlotte Ripps. Riley Mann, Scott Mann, Joshua Mann, Will Ripps, Tyler Kierstead, and Jordan Sullivan will serve as pallbearers. Visitation will be held from 5:00 pm to 9:00 pm Wednesday, February 6, 2019 at the Hurley Funeral Home Chapel, 14822 Main Street, Lytle, Texas. A graveside service will be held at 10:00 am Thursday, February 7, 2019 at Black Hill Cemetery, in Lytle, with interment to follow. Anyone wishing to leave condolences for the family, share memories or sign the guestbook may do so at www.hurleyfuneralhome.com. Arrangements are under the direction of Hurley Funeral Home 14822 Main Street, Lytle, Texas 78052, (830) 709-0698.